Since all of us are beauty junkies and we are probably thinking about getting more products every day, I believe it's good to make a list of those things we REALLY want instead of buy anything we see. I love trying new make up but if I'm going to buy high-end products, I prefer to read some reviews first.. otherwise my pocket will cry several days! I'm travelling to the US for the first time next week and I'll be probably purchasing these things. Please let me know if you own them! 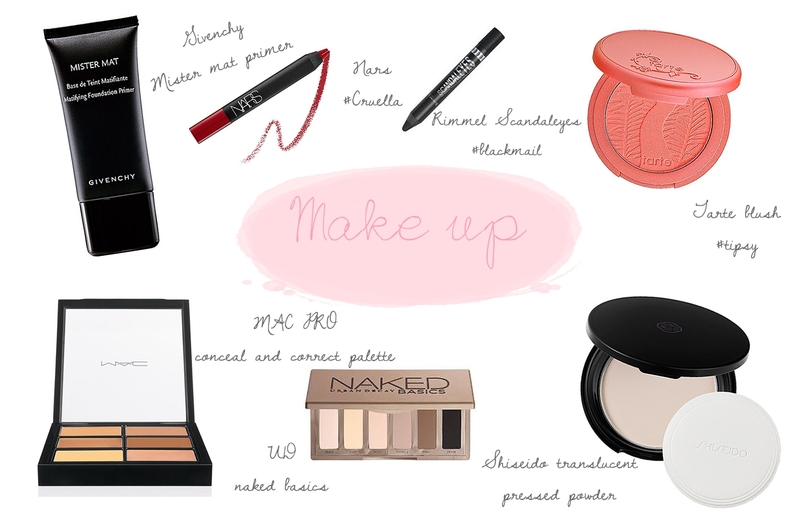 Ya que a todas nos gusta el make-up y probablemente estemos pensando en ello gran parte del día pense en hacer una wishlist para enfocarme bien en los productos que realmente quiero en vez de comprar cosas a lo loco. De hecho las tagueo a todas para que hagan este post así vemos cuales son los productos que tenemos todas en mente! En una semana me estoy yendo a USA y espero poder comprarme varias de estas cosas ya que como todas sabrán, allá está todo mas barato! Nars velvet matte lip pencil in cruella ($25) looks like the kind of lipstick that makes your teeth look really white and can make any outfit look sofisticated. I'd love this product for special ocations. I'm always looking for good primers for oily skin, I don't really care about hiding my pores that much but I saw that Givenchy Mister Mat Mattifying Foundation Primer ($33) is an excellent option and so far I've seen only good reviews about it. I was also looking for an alternative to my Mac Blot Powder and I found that Shiseido Translucent Pressed Powder ($32) is a great powder that doesn't leave any color in the skin. Who doesn't want this Mac Pro Conceal and Correct Palette ($40)? Seriously, it's crazy! I was also looking for good eyeshadow bases until I saw the review Coco did on her blog about this Rimmel Scandaleyes eyeshadow stick in blackmail ($4.49) and I was stunned! Rimmel keeps getting better all the time. Who doesn't want the new Urban Decay Naked Basics Eyeshadow Pallete ($27)? I'm a very neutral girl and I'd love to own this palette soon as I don't have any UD products yet. Same goes for Tarte Amazonian Clay 12-hour blush in tipsy ($26), such a pretty coral! I've heard about Perricone MD a while ago as it is a very expensive brand that makes only awesome products, I believe this kit Intensive Pore Minimizer and Intensive Pore ($98) treatment could suit me well though is quite pricey. Same applies to Murad Oil-Control Mattifier spf 15 ($40), not the cheapest brand ever but I've heard it works and I really need some moisture. 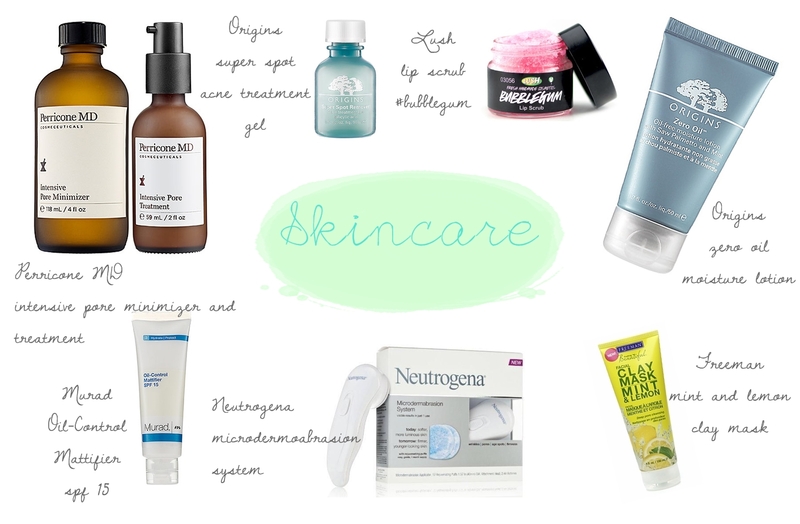 One thing I'm excited to try is Neutrogena Microdermoabrasion System ($20), is for all those who does not dare to buy a Clarisonic cause we affraid to spend $150 for something we don't know if it works! Gladly I've seen reviews of this product in youtube and all were positive! Bargain alert? I'm exciting about trying Origins, well I'm excited about trying all these products as they are not sold in Argentina! I've seen they have good anti-blemish products so I want to try the Super Spot Acne Treatment Gel ($14.50) and Zero Oil Moisture Lotion (26.50). Do you wish to own the same products? Tell me! Todos los precios son el dólares ya que así los busqué en Ulta, Sephora, etc. Sería genial si vendieran todo esto en Argentina, no? I love the origin spot gel although it's really drying so if you do buy it, I recommend you use the minimum amount possible! quiero probar perricone por favor .....comprala!!! De estos productos tengo el rubor de Tarte, que es precioso y el lip scrub de Lush que me encanta y es riquísimo!!! Ambos valen la pena! La mini naked...es una gran compra..la tengo y estoy enamorada!! No tengo nada de eso :/ buuu quiero todo! ajajaj Ojala consigas la paleta de MAC.. esta bueniiisima! Buen finde reina, un besote enorme ! Hola Flo! Ojalá puedas comprarte todo, yo me llevaría medio estados unidos jaja. Alucinaría! Flo! :) me encantó tu wish list para llevarte y conseguir todos esos productos! tengo que decirte que si yo haría la mia , seria un PAPIRO lleno de cosas jaja. Me gustaria que algún día hagas un post dedicado al cabello, tus rutinas , productos desde shampoos , mascaras cuidados adicionales ! gracias y besos. Love the Shiseido Translucent powder, though Laura Mercier's is equally good (I use both. Will review the Laura Mercier if you want). LUSH Bubblegum lip scrub rules! Yo tengo ese blush en coral de Tarte! Es HER MO SO, es mi preferido, y tambien tengo uno que es rosado mas fuerte, genial tambien. Ojala puedas comprarte todo o la mayoria! Hay que aprovechar que alla esta bastante barato. Fantastic list! Makes me want to add a few more goodies to my own wishlist :) I have NARS Cruella and it's one of my favourite reds ever. The Lush Bubblegum scrub is fab too!